Is it any wonder that we’re confused about food? Healthy eating used to be a harmless phrase, perhaps conjuring the image of a home cooked meal of meat and three vegetables. Simple. Then all visible forms of fat got taken off the plate and replaced by pasta, which later was swapped for quinoa and kale. Then it was meat and vegetables again but skip the grains. Now Nestle´ has a new campaign marketing some of their processed foods, such as a famous chocolate drink containing 46% sugar, under the “wellness” banner. It appears that health and wellness have officially” jumped the shark”. With clever marketing that undermines common sense, it’s understandable that “healthy eating” has copped a fair amount of criticism. Many of us have forgotten how to listen to our body rather than our head, to be in touch with what we really want to eat. The other poster girl for “healthy eating”, a lithe young women Instagraming her salad in a jar, also comes with a cautionary tale. Unfortunately these articles miss the real issue; kale hasn’t made them ill – a mental illness has. Orthorexia is a controversial term coined by Dr Steven Bratman to describe an obsessive focus on so-called “healthy eating”. The emphasis being on the obsession, rather than the type of food. While the term orthorexia is widely used, the disorder is yet to be recognized in the psychiatric “bible”, the DSM (Diagnostic and Statistical Manual of Mental Disorders). Eating disorders have hidden behind bogus diets for decades, long before the invention of social media. Same problem, different diet. Just like the exercise obsessives, pushing their body beyond healthy limits to “burn calories”, have ditched their Jane Fonda workout videos and legwarmers, for gym programs and endurance events. So many women and a growing number of men have been at war with their bodies since puberty, though not all of them clinically suffer from body dysmorphia. But subclinical eating disorders are more prevalent than you’d imagine. I’ve lost count of the number of women I’ve worked with naturopathically who confess they spend a large proportion of the day struggling – thinking about food, feeling disgusted after eating, mentally calculating every kilojoule or hating the image they see in the mirror. This is not “healthy eating”. Far from it. When is an interest in diet or exercise unhealthy? Always thinking about food, calculating the calories/kilojoules or bargaining about the amount of exercise required to burn it off. Using food or exercise as a punishment, such as only eating carrots or an excessive work out for some perceived dietary transgression. When food choices result in excessive weight loss, or maintain a BMI under 18.5. Self abuse and other negative thoughts and behaviours. Sick of the struggle around food? Book a Wellbeing Plan with Gill. 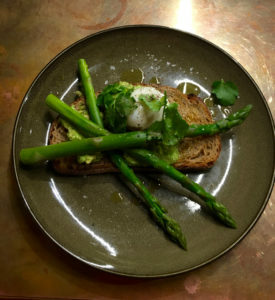 Sydney airport: avocado, asparagus and poached egg on rye. Most healthful option available on the day (unless a coeliac). Our relationship with food or drink shouldn’t be a struggle. While food choices are a symptom of an eating disorder, they’re not the cause. It’s often about feeling unsafe in the world and an attempt to gain control through restricting what we eat, induced vomiting, amphetamines or excessive exercise. This is a serious mental health issue and requires specialist help. It’s no wonder that we find the messages around “healthy eating” confusing, when the two extremes of the chocolate drink or a meagre serve of salad are often used as the prime examples. Avoid clickbait. Ignore opening headlines (like this) that demonise or glorify a single type of food. Tune into your body, rather than your head, before deciding what to eat. How hungry am I right now? What will nourish my body? Feast your senses. Before putting food in your mouth take a good look, smell and even touch your food (if appropriate). Each of these senses should attract rather than repulse your food choices. Eat mindfully. Follow the five S’s. Focus on what you include (such as fresh vegetables and food you have to chew) rather than exclude, in your diet. Don’t forget that what we put into our body is only part of the equation. Did you know that stress can impact on how our body digests even the most health affirming foods? Our state of mind effects every cell in our body. Eating disorders are not about diet, they’re a psychological condition, coming from the brain, not fat cells. I suspect the only diet we really need to eat well is one that gives us a break from the media and advertising. 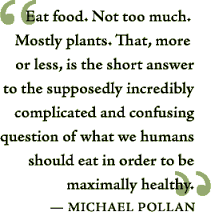 It’s no accident that we’re confused about food but when we reclaim common sense, it’s easy eat healthfully. The problem with “clean eating”? 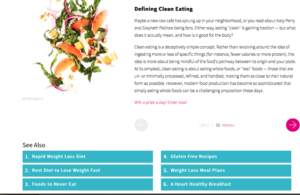 This “fitness” site doesn’t discriminate between healthful eating and unhealthy rapid weight loss diets. I like that and yes I think too much kale can make you sick. I heard people saying they only “eat” green smoothies and this is really healthy!! Yesterday’s cottage cheese is today’s ‘green smoothie’! The disorder remains the same, only the object of low-calorie fixation changes. What will be next do you think?